An annual April meteor shower will peak tonight (April 22), but skywatchers shouldn't expect a spectacular show, experts say. The Lyrid meteor shower is usually one of skywatching's annual treats, and this year they occur through Monday, April 25. The shower peaks tonight and early Saturday morning, but a bright moon will likely outshine many of the meteors, making them hard to see. Still, stargazers with clear, dark skies can see some streaking space rocks tonight if they venture outside and look up. Meteors could be zipping by at a rate of 15 to 20 per hour. In the Northern Hemisphere, looking skyward for meteors after 10:30 p.m. local time tonight should be productive, weather permitting, according to the International Meteor Organization (IMO). But the best viewing is likely to be in the hour or so just before dawn on Saturday —from 3:30 a.m. to 4:30 a.m. local time, experts say. In the Southern Hemisphere, good viewing won't start until well after midnight local time, the IMO said. 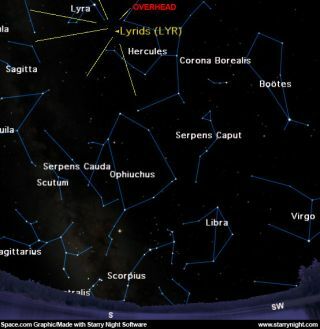 The paths of the Lyrids seem to diverge from a point in the sky about 7 degrees southwest of the brilliant blue-white star Vega, in the small constellation Lyra (hence the name "Lyrids"). So that's a good place to start looking. Your clenched fist held at arm's length measures about 10 degrees in width. Like other recurrent meteor showers such as the Leonids, the Lyrids are caused when the Earth plows through leftover bits shed by a passing comet. In the case of the Lyrids, the source is in all likelihood comet Thatcher, which last swung by Earth back in 1861. Thatcher has an orbital period of about 415 years, so we won't see it again for a while. But the icy wanderer has left enough pieces of itself behind to put on a show for skywatchers every year. Even if the moon dampens this year's display, it's still worth a trip outside to catch a glimpse of these comet bits as they flare up in a kamikaze dive into our atmosphere.